Ok… you may want to read this entire article before you do. The news is alarming. In the last four years millions have lost their job. My recommendation is for you to quit your job before you’re fired. Now, before you march in and tell your employer to take this job and… “love it,” hear me out. The traditional idea of a job is obsolete. The fact is, we’re all entrepreneurial. You’re entrepreneurial in the sense that God has designed you and put within you a deposit of ability, a gifting that will afford you the resources to meet the needs of your life, supply the desires of your heart and your family, and even finance your purpose. Discovering this deposit is one of the most rewarding adventures known to man. When you make this discovery, you’ll never work another job in your life. No, your life will become a passionate pursuit of meaning and fulfillment. The other day, I glanced at a photo that was taken on the first tee of Pebble Beach. In that picture, I was standing with four other men that I have mentored through the years. This picture was taken at the beginning of our relationships. Now, all four of those men are extremely successful, financially secure and fulfilling their purpose in life. As I reflected upon God’s goodness in their lives, I also realized that each of them passionately pursued their individual and specific gifting. Not one of them had a traditional job. Let me ask you a question. If you took a photo of yourself today and revisited that photo in ten years, will you be “doing the same ol’, same ol’?” Or will you have fulfilled those ten years pursuing your life with passion? The key is to discover your ability and gifting that God has deposited within you and transform that into a marketable skill that gives you sustained income for a lifetime. How do we do that? If you allow it, you will be conformed to the pattern of this world. In other words, conformity will take over your life and you will become a compliant participant in the monotony of routine. Be transformed. This means that you must go through a metamorphic process. To literally take on a new form. This may require a physical transformation including getting into shape. The fact is, you will never fulfill God’s best in your life if you do not have the physical stamina to endure it. This also means you may need to learn something that you don’t currently know in order to achieve something new. Renew your mind. Your mind has incredible ability to learn. Don’t believe the lie that you can’t learn or comprehend. You have the ability to grow in knowledge, discernment, understanding, and wisdom. You must develop a ferocious appetite of reading. Today’s technology is amazing and affords us an inexcusable opportunity to take in new information. On a daily basis, I have the opportunity to sit down with the most brilliant minds in the world through books, videos, articles, tweets, etc., to learn from these people freely. The discovery of your gift will not come easily, nor will you discover it by copy-catting someone else. No, the secret is found in 1 Corinthians 2: 7-10. You will never discover your deep reservoir of potential without knowing and understanding God and His original intent for you. 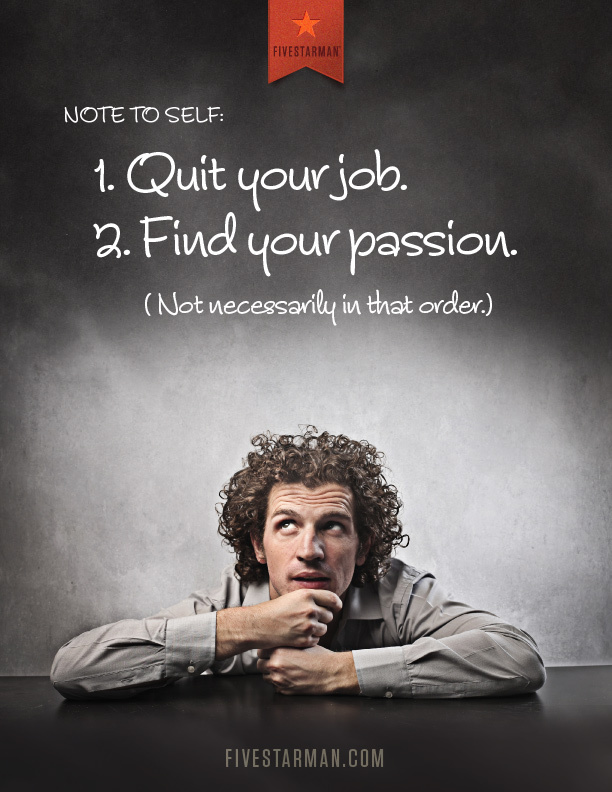 So, don’t quit your job—yet. Wait until you have fully discovered your God-given ability and gifting and discerned how to turn that into a marketable skill for sustained currency.